Cake mascara can rival the wand! If you'd like to bat glamorous lashes just like Marilyn Monroe's, it may be time experiment with cake mascaras. 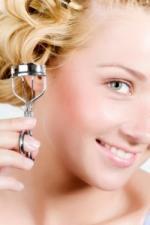 You've got the lash curler and perhaps a lash comb, but that wand of mascara is leaving you less than satisfied. We've all experienced the dreaded clumps and smudges while painting our lashes with wand mascara. If your lash routine needs a booster, and you're willing to swing a learning curve, get ready for your lashes' new secret weapon. Brush on mascara separates, darkens, defines and pumps up the volume on thin, sparse lashes. Unlike ordinary wand mascara, cake mascaras can be reapplied and layered upon without clumping; this means controlled depth and definition. Cake mascaras lasts forever and offer increased sanitary protection. Mascara brushes are rinsed with water after use; leaving no nasty bacteria to be leery of. Cake mascaras also have a vintage past; if you appreciate the good old days of mood lipstick and Coty's Airspun Powder, cake mascara is a must have staple for your beauty bag! Remember to curl those lashes. The idea of cake mascara may seem intimidating, but fret not; the mascara is simple to apply and just takes a few more steps. Have fun with the application and start combing. Curl lashes: Always curl lashes prior to applying mascara, whether you are using the wand or cake variety. A curled eyelash will add volume and lift the eye upward. Curl lashes twice. One curl at the tip of the lashes held for thirty seconds; the second at the base of the lashes, held for an additional thirty seconds. Brush on: Moisten the applicator brush included in your cake mascara pan. Layer enough mascara on the brush and sweep gently on the lashes from base to the tip of the lash. Cake mascara is easy to work with, and color can be reapplied until the desired depth is achieved. Comb out: The most important step following your cake formula mascara application is combing your lashes. Comb lashes from the base of the eye to the tips to separate and define. When shopping for cake pan mascaras, consider your color options. 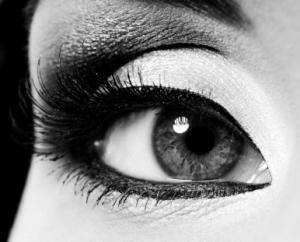 Black Mascara: Black mascara adds the most impact and will draw the most attention to your eyes. Black mascara looks great on everyone and works day or evening. Brown Mascara: Brown mascara is a great option if you are trying to achieve a more natural lash. Brown mascara works best in the daytime; if you are planning an event where you want your eyes to be the center of attention, avoid brown mascara and stick with black. Burgundy Mascara: Burgundy, violet and maroon mascaras look gorgeous on hazel eyes. Green eyed gals can wear these colors and make their eyes pop. Unless your eyes are green or hazel, red toned mascaras may make the eyes appear sleepy, or worse, infected. Better to opt for brown, blue or black varieties. Fashion Color Mascara: While fashion colored mascaras such as blue, sapphire, green and glitter varieties can add flirty sparkle to your eyes, they are not readily available in cake pan formulas. Stick with wands if you like fashion colors. Brush on mascara may last all day without smudging, running or bleeding, but the benefits don't stop there. When you're jet-setting 10,000 feet above the ground you can rest assured your lashes will look great when you arrive at your destination. Despite increased security measures, the FAA has approved cake pan mascara for on-board travel. That's right ladies, prepare for a flake, smudge and clump free landing.